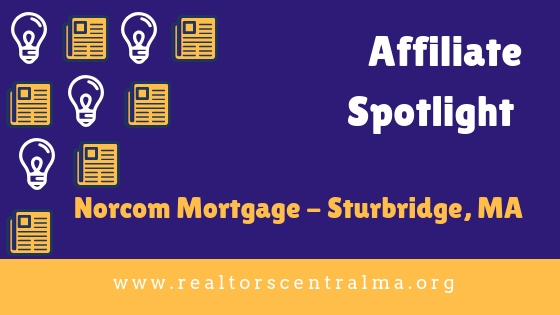 Sturbridge, MA – Kristen Walther, Branch Manager of Norcom Mortgage’s Sturbridge, MA location, recently announced the relocation and expansion of operations from its 71 Main Street office, to 135 Main Street. The larger facility serves to accommodate a growing team as Walther plans to hire several new Loan Officers through the New Year. The Sturbridge Branch has experienced consistent success and progressive growth over the past eight years with Norcom. In addition to Walther’s MA licensing, she can now service the states of RI, CT, NH and ME. They recently welcomed new Loan Officer, Carrie Sanchez, and celebrated the promotions of Jeremy Nowicki to Sales Manager, and Processor, Amber Duval is now a licensed Loan Officer Assistant. Walther has recognized by corporate as one of the company’s top producers. Norcom Mortgage was awarded Top Workplace by the Hartford Courant for the seventh year in a row, and recently launched their pre-approval program, JumpStart with Rate Assurance. This program allows potential buyers to be pre-approved for a loan, and then lock in their rate for up to 90 days while they search for the perfect home. If rates go up, the initial rate is guaranteed, and if they go down, the lower rate is assumed. “JumpStart pre-approval with Rate Assurance is just one of the many tools we have in our arsenal to guarantee buyers the best-secured rate and a seamless process when purchasing a home,” stated Walther. In addition to standard loan offerings like FHA, VA, and USDA products, Norcom also offers the Norcom Dream Home Loan, designed to help a buyer finance upgrades and renovations to a property, and the NorFlex Home Loan with adjustable terms to cater to individual budgets and timelines. “We are so excited for the year ahead in our new space. It’s given us a renewed sense of energy and commitment to our customers. Our doors are always open, so please feel free to contact us anytime to schedule an appointment to visit our new location and meet our team. Visit our trusted partner, Norcom Mortgage, for all of your mortgage needs!